Heat oven to 350°F (325°F for fluted tube, dark or nonstick pan). Grease and flour 12-cup fluted tube cake pan or 10-inch angel food (tube) cake pan, or spray with baking spray with flour. In large bowl, beat cake mix, dry pudding mix, water, butter and eggs with electric mixer on low speed 30 seconds, then on medium speed 2 minutes, scraping bowl occasionally. Stir in chocolate chips. Pour into pan. Bake 46 to 54 minutes or until toothpick inserted in center comes out clean. Cool 15 minutes in pan. Remove from pan to plate. Cool 10 minutes. 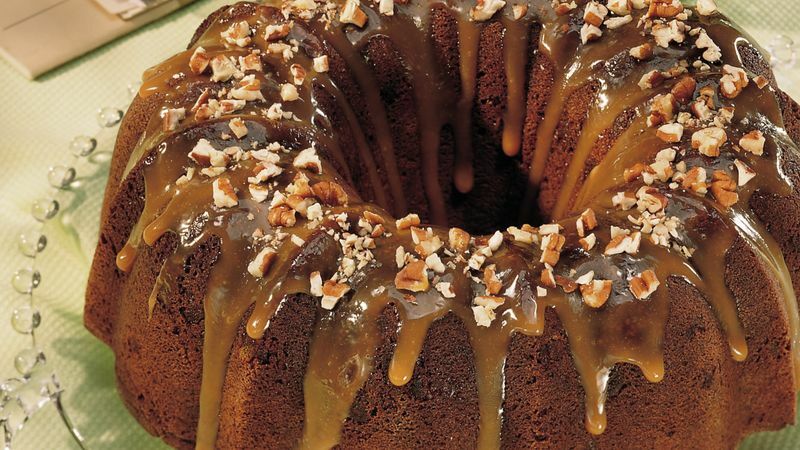 Prick top of warm cake several times with fork; spread caramel topping over top of cake. Sprinkle with nuts. Cool completely, about 1 hour. Store covered. Can’t get enough of the good stuff? Pass bowls of caramel topping and extra chopped nuts for an extra-rich hit! Be adventurous! Drizzle chocolate topping as well as caramel topping over the cake!